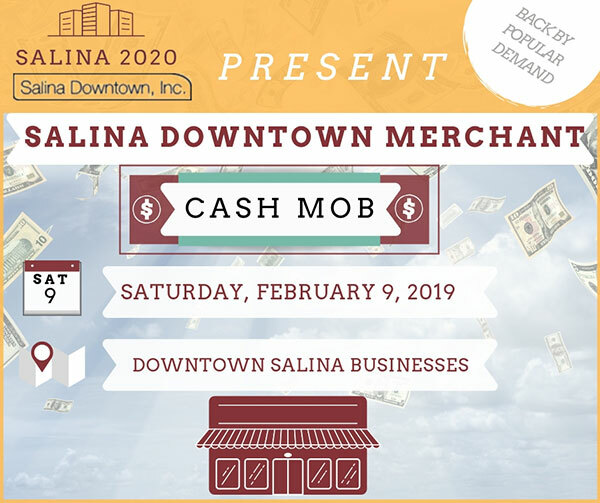 Back by popular demand and designed to benefit downtown businesses during construction, Salina 2020 and Salina Downtown Inc. are pleased to host a second Cash Mob event on Saturday, February 9, 2019. Shoppers are encouraged to patronize stores, restaurants, bars and businesses during the event, which will be held during merchants’ regular business hours. While shoppers are encouraged to spend cash, cash payment is not required to participate in the event. In celebration of this event, Salina 2020 is hosting a brand new social media contest, encouraging social media users across Facebook, Twitter and Instagram to spread the word about the Cash Mob event for the chance to win a $50 gift card to one of 20 downtown businesses. For non-social users, enter to win forms and boxes will also be available at a variety of stores, restaurants, bars and businesses for the duration of the event. For more information and official rules for both entry methods, please visit the Salina 2020 contest post. Copyright 2019 Salina 2020. All Rights Reserved.